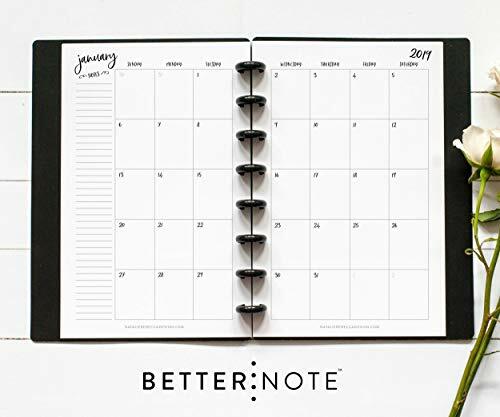 BetterNote Monthly Calendar | Half-Letter Size | 5.5"x8.5" | BetterNote. Because it's time for a Better Notebook. BETTERNOTE is a system that allows you to customize your notebook the way you want. The "peel and press" pages can be added in whatever order makes sense. And if you change your mind, no worries- just change your pages! This calendar will fit a Half-Letter sized disc-bound planner. The size is 5.5"x8.5" and has 8 discs. This calendar starts in January 2019. For a calendar with that runs from July 2019 - June 2020, search for item B07P7QYSVC Looking for a complete notebook? Check out our notebooks that come with dividers, pages, and a reversible matter cover! Search for "BetterNote Collection" in the search bar above These pages are perfectly sized for your favorite Junior Disc-Bound planner (8 discs, 5.5"x8.5") and come already punched! You will receive a year's supply of monthly calendar views. Please note: this is for the monthly pages only. You will not receive weekly views For a calendar with weekly and monthly views, please search for item# B01M1JN2RV in the amazon search bar above. For a calendar with Divider Tabs, please search for B06Y1T7P28. What's your style? We offer CLASSIC and WHIMSY versions of many of our designs! We also offer an extensive selection of pages, dividers, and beautiful matte covers that work with the BetterNote system to give you a ton of options to make your notebook exactly what you've always wanted. BetterNote pages, dividers, and covers are compatible with all other discbound systems like Levenger Circa, ARC, TUL, etc. All pages are printed black and white- any color or decorations shown are for inspiration! All designs are copyrighted to Natalie Rebecca Designs and are not endorsed or certified by Levenger, Staples, Office Depot, or any other company.